Control holiday decorations, Christmas tree, pool pump, sprinkler system at the touch of a button from inside your home. Enjoy your porch accent lighting without having to plug and unplug the lights each time in the dark or cold. Operate your fan, heater, aquarium, humidifier, floor lamps and ceiling lights without getting out of your warm bed in winter. Get to hard-to-reach outlets; operating electrical appliances in difficult-to-access areas from anywhere in the house whenever you want. Simplify your life with Dewenwils wireless remote control electrical power hub. Durable weather resistant PPO shell and SJTW 14/3C heavy gauge extension cord resists abrasion, moisture, and exposure to direct sunlight. The outlet must be mounted in a vertical position with the sockets facing downward at least 2ft above ground level. 3 grounded outlets provide more options when you need more than one plug. 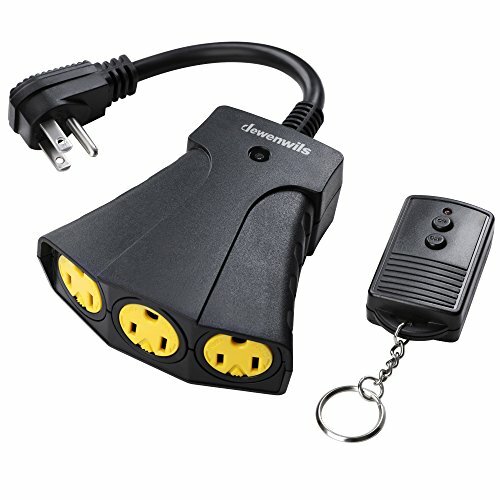 With this product, you will get room to add on 3 strands of lights, or plug in different appliances. All 3 outlets are controlled by the remote at the same time. No programming needed, the transmitter and receiver outlets have been paired in advance on fixed frequency channel. Available in A B C D E F channels for the RF remote and the channels cannot be changed. Orders arrive with random channel assignment. The wireless switches remain "OFF" when power resumes after a power cut to save energy.